Learn the colorful art of mosaicking with Barbara McNally! Tools and a large assortment of colorful tiles await your creative play in this 2-day workshop. We’ll talk about design, color, and mosaic techniques and then get right to work. 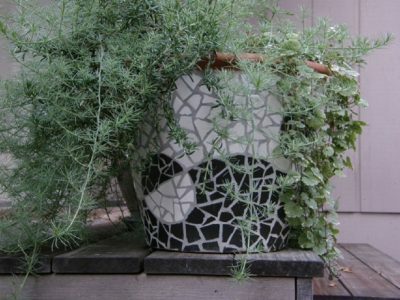 Bring your own substrate on which to mosaic, such as: a small table, med-large terra cotta pot, flat wooden frame; for outdoor mosaic: a piece of cement board cut to any shape; or Barbara can provide cement board or stepping stone if requested.